Properties: A Solaris crystal takes energy from the sun and glows with its own internal light source, making it invaluable for night vision. The glow eminating from the crystal is one centimeter per cubic centimeter of crystal, naturally. When charged by the sun’s rays, the light from the crystal can last up to four hours, depending on the size and energy. A Crystal Worker can make the crystal last as long as ten days without needing to be recharged as well as extend the natural illumination by a hundred centimeters. Where it’s found: An extremely common crystal, Solaris crystals are found nearly everywhere in the known worlds, particularly near large water sources. They jut from the ground just like trees and can be cut easily with a sharp iron blade. 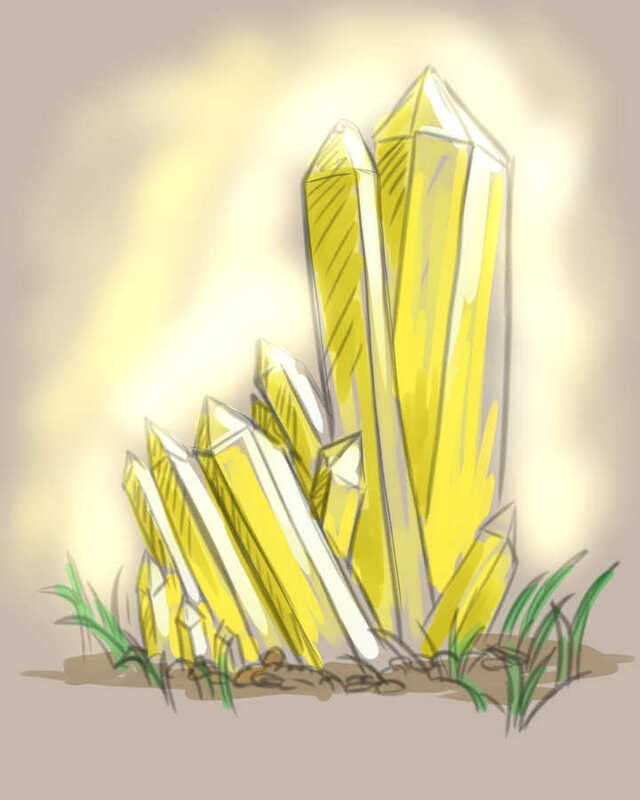 Many towns build their buildings around such crystals, using their natural ability to light streets when the sun sets. Many crystal workers also grow small solaris crystals in their homes using a solution of fresh water and solaris dust. These home made crystals are more fragile than their natural counterparts and need to be taken to a crystal worker every few months to prevent them from dissolving.